For comfort you can depend on and style you will cherish, this stationary sofa is just what you need. Hand-crafted and hand-tailored for the ultimate in function and fashion, this piece features 8-way hand-tied coil construction, plush upholstery and layers of cotton batting and pre-formed rubber for a soft and supportive place to relax. Its contemporary style features sloped track arms and tapered wood legs, creating the sleekest silhouette for your living room or family area. 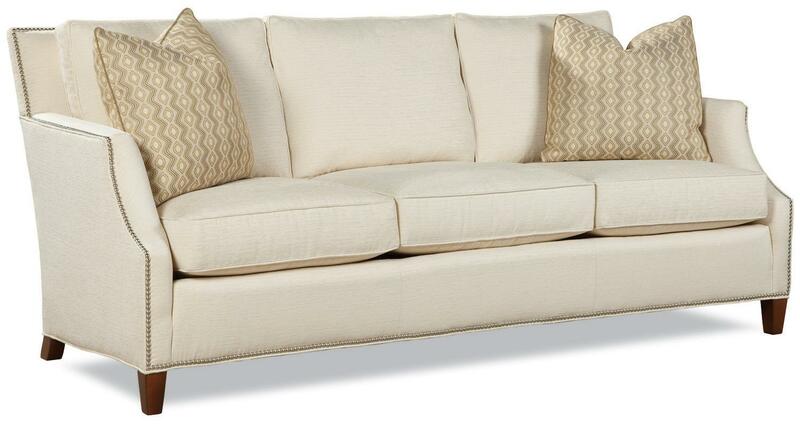 With room enough for 3 people, this sofa is made for lounging with family and friends. The 7115 Contemporary Sofa with Tapered Wood Legs by Huntington House at Wayside Furniture in the Akron, Cleveland, Canton, Medina, Youngstown, Ohio area. Product availability may vary. Contact us for the most current availability on this product. Tailoring Fabric and leather patterns are measured and marked by hand to insure accuracy. Fabrics and leathers are individually cut by hand with great attention to detail and quality standards. Seat Wrinkled Elegance. The WE cushion, standard on many styles, features a polyurethane core wrapped in Dacron fiber, and then sewn into a down-proof ticking. Providing our softest, most relaxed seat.